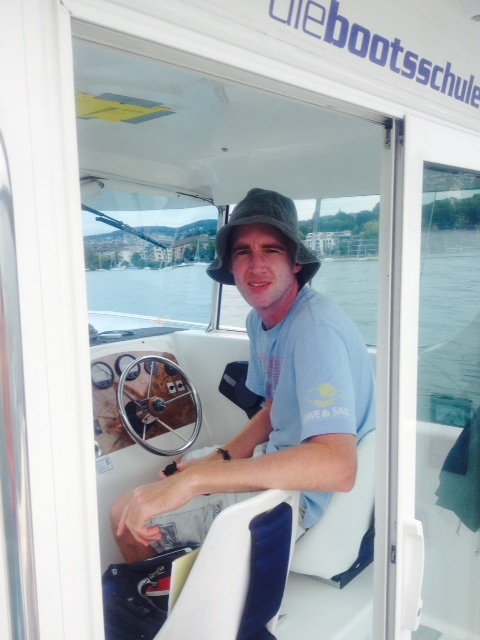 On the 25th July Paul and I flew over to Zurich to swim the prestigious Lake Zurich race. Paul & I had entered the year before but not got a space so we were over the moon when we found out we got a slot for a two person relay for 2015. This was the third relay Paul & I have done together in as many years. The previous two were the six person one way relay of the English Channel and also the two way four person relay of the Channel. 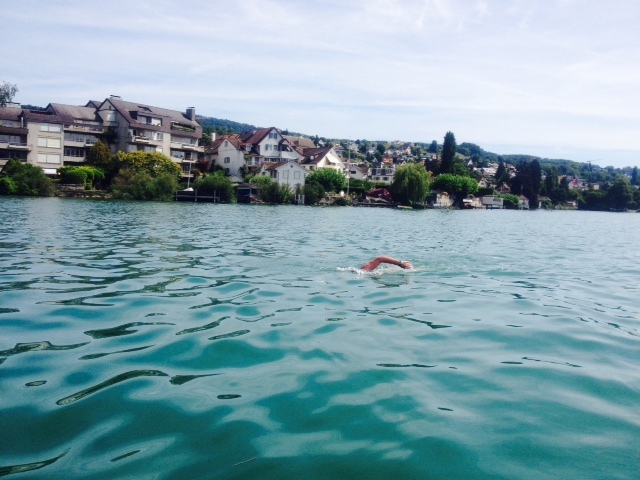 We arrived into Zurich and headed over to Rapperswil the other side of the lake where the swim would start. It is funny as you sit on a train for 26km realising that the next day you are going to have to swim that. We headed over to the briefing where all the solo and relay swimmers were given details about the rules and schedule for the next day. It was nice to see many others from the marathon swimming community that I have met and become friends with over the years many of which were doing it solo. Paul and I walked over to the marina at 6.30am to find our pilot. One of the wonderful things about this swim is that the community comes together to offer its services for the swim and so you don’t know what type of boat you are going to get or who your pilot is until the morning of the swim. As teams went off with pilots sporting fancy power boats to yachts to little rowing boats and kayaks we awaited to see what we would get. Next minute Mat walks up and introduces himself to us as our pilot for the day. This was Mat’s first time supporting the swim but he works on a boat school on the lake so we had no worries about him knowing the lake well enough to get us from one end to the other. The boat was a spacious motor boat which we loaded up ready for the 26km trip and Paul headed over to the start. Mat & I motored around to towards the start as we saw the solo swimmers set off and we waited for the relays to start. The swim allows for solo swimmers and relay swimmers (team of 2 or 3) and in both wetsuits and non wetsuits, although at a balmy 25 degrees those in wetsuits must have been a bit toasty. The start was interesting – the swimmers head off but then us on the boats have to find our swimmer – set with a pair of binoculars I found Paul and we motored over to him to lead the way for the next hour. The relay swim rules state that swimmers must swap every hour so after enjoying the sunshine and chatting away to Mat it was time for me to jump in. Compared to the cold waters of the UK this water was bliss and we were so lucky with the weather, just the day before the wind had built up big chop across the lake but today was so flat and peaceful – it was great to be enjoying some warm flat waters. After I got out Paul had left me a little note which was great to receive, it was lovely not to be doing a solo swim and to have some company but the problem with a two man relay is you don’t get to speak to each other – so for the rest of the swim we left notes for each other. As I got out of the water each time I really looked forward to reading my note. Paul and I were motoring along looking at going just under the 8 hour mark when I noticed that Paul had started trying to stretch out his shoulders whilst swimming. When you have swam with someone so much over the years you get to know their stroke so when it changes you know that something is up. Paul started slowing down and so I left a note to see if he was okay – I would have to wait an hour till I got out to find out. Turned out that Paul was in some pain from his shoulders and was suffering somewhat, but he ploughed on regardless and we carried on swapping every hour. It was lovely having Mat aboard as he grew up in the area and was able to point things out and tell me about different parts of the lake as we passed them (when I was out of the water that is) as well as waving at friends fishing on the side of the lake. As we approached the last 300m of the lake I jumped in with Paul and we swam to the finish together whilst Mat motored over to the marina. At the finish you are greeted with a lei and your medal and interviewed by a lady asking you about your experience. In the end it took us 8 hours 44 minutes and although Pail was clearly in a lot of pain he managed to grit his teeth and get us to the finish line. It is a very well run event and you are treated at the end to some wonderful vegan food and massages etc. It was great to cheer in some friends into the finish and relax – that was until the last swimmer came in and the rain fell. We had been so lucky with the weather and as we sat on the bus back to Rapperswil following the lake I reminded myself ‘we just swam that’. I wonderful day with wonderful people in wonderful surroundings. A big thanks to Mat for getting us there in one piece avoiding the traffic on the lake including the ferries that were on a tight schedule and didn’t like to detract from their usual journey line. This entry was posted in Swimming and tagged LakeZurichswimming, Marathon Swimming, srichinmoyraces, swimming. Bookmark the permalink.